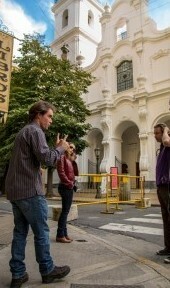 Discover the real Buenos Aires on a private walking tour with your own personal guide, from the highest-rated private tour company in the city (*as per TripAdvisor rankings). If you have a whole day available, our (7 Hour) Full Day Private Walking Tour is the best way to see the most important sights of the city. Less time? Try a shorter tour from the durations listed below and we can help plan the best tour for you in the time you have to spare. Please note, pricing below is for private walking tours for up to 3 people, but we do of course accept bookings for larger private groups (you will find that pricing during the booking process). What Sets BuenosTours Apart From the Rest? 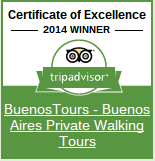 Due to consistent fabulous reviews from our delighted clients, TripAdvisor, the most popular travel review website in the world, has awarded BuenosTours their "Certificate of Excellence" in all seven years since our private walking tours began to be listed on their website - making us inaugural entrants in the TripAdvisor Hall of Fame. One happy customer after another has seen BuenosTours maintain a perfect 5/5 rating and be ranked on TripAdvisor as the Number 1 Private Tour Company in Buenos Aires. 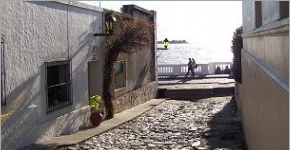 "After researching several options for walking tours for a recent trip to BA, I selected BuenosTours. I definitely made the right choice. My positive experience began as soon as I submitted my request through the BuenosTours website for a “BA 101″ Full Day Tour. Throughout the entire booking process, the customer service was excellent. I received follow-ups, confirmations and travel tips from Quincy, Alan, Justine and Oliver. This high level of customer service made me feel very good after booking my tour on-line... from the other side of the world. On the day of the tour, Oliver, my tour guide, met me at my hotel at the agree-upon time. He was a wonderful tour guide. He is very knowledgeable about BA and has a great personality. He made me feel at ease in a strange city and he truly brought BA to life with his stories. Unlike other tours, where you can feel like you’re on a walking lecture, with Oliver I felt like I was exploring a beautiful city with a very knowledgeable friend. 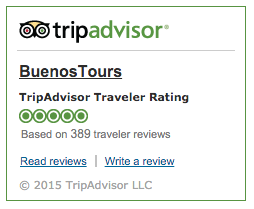 I usually don’t write reviews, but as I hope you can tell, I highly recommend BuenosTours!" And there's more where that came from! 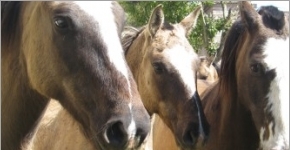 You can read more online reviews, buzz and press for BuenosTours here, and don't forget to check out these testimonials from our happy clients here. 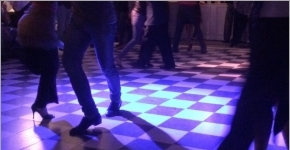 Read our thoughts on tango-dinner shows in Buenos Aires, and how you might best discover and experience tango dancing in the city where it was born. Bonus: Free Online Guide to Buenos Aires City! Whether you decide to book a tour with us or not, if you're planning a trip to Buenos Aires make sure you check out our free online guide to Buenos Aires. Packed full of restaurant reviews, accommodation advice, shopping tips and things to do, this comprehensive and frequently updated blog magazine will help you make the most of your time in BA. You'll find information on local food and drink, nightlife, tango and local culture as well as general advice & travel info and a breakdown of neighborhoods to visit. If you are keen to discover Buenos Aires' lesser known gems be sure to read up on off the beaten track areas. And don't miss our suggestions for day trips outside the city and beyond in the further afield section. Enjoy!